One more Phablet has been launched, Byond Tech comes with their latest Android based Phablet Smartphone. 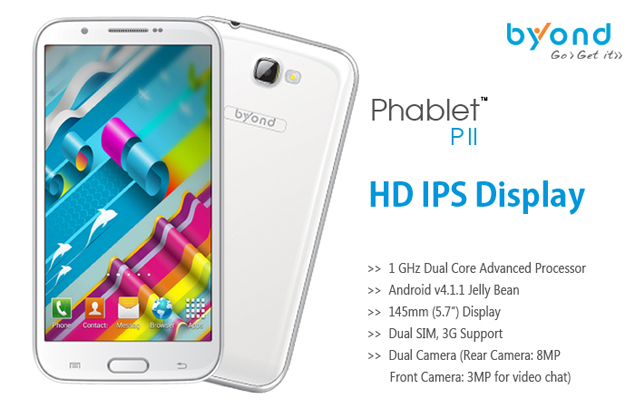 Byond Phablet PII is an HD phablet with huge display screen of 5.7 inch and has IPS display. Resolution of the phablet is 1280 x 720 pixels which is very good and watching HD videos of 720p will be a awesome on this device. This Phablet will be a tough competition to some of the well establish brand such as Micromax which has announced launch of their first HD Smartphone, Micromax A116 Canvas HD which will be available from 14th Feb 2013. Byond Phablet PII is powered with dual core processor which is clocked at 1.0 GHz and has 1GB of RAM to support smooth operation of the device. It runs on the latest Android Operating System Version 4.1 Jelly Bean. Making video calls from this device will be one feature to look for, it has a 3.0 MP front facing camera which is not present in most of the high end Smartphone’s also. Also presence of 8.0 MP rear end camera makes it suitable device for capturing photos from daily moments. Internal Memory is 4GB which is expandable upto 32GB with microSD card. Battery Capacity is 2,500 mAh which seems a bit lower on side compare to huge display size of the device.